Great courses. Great judges. Great Competitors! Great People. Thank You! to DAN Feyder and the host Club: Ameteurs du Chien de Race, who worked tirelessly all weekend to make it all happen! Greetings, I am from Canada and my friend and I are travelling with our dogs to Europe this summer. Are the entries closed for your trial or may the two of us still get enter? 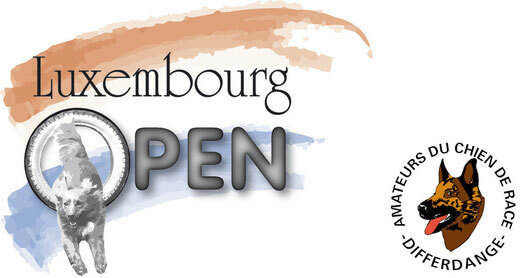 You comfirmed my participation with my bc Luna Tale Inspirepip for the Luxembourg Open. I also have fill in a page for my other bc Never to Beat Luna Tale Dei Matiblu. But I didn't get a comformation for him ? Is that correct ? I would found it a pity if I only can compete with one dog if I send 2 dogs in for the competition. I am so happy to be on the Large Dog Start list with my Dogs, Vivian! and Serena. Did I make some sort of mistake? ne sachant pas que ma fille m'avait inscrite,il se trouve des doublons dans les listes. Vous pouvez annuler les lignes 17 et 22 en small de la liste d'attente. Je maintiens l'attente pour la ligne 37 en médium;le nom du chien est GRIOTTE . Le chien inscrit en small S061 s'appelle EASY UP. Désolée pour toutes ces erreurs. Können Sie sich auf T-Shirts bei uns kaufen können wir Sie diese zu besonders günstigen Preis anbieten. Hello, finally the new website is online. We are sorry that we had to change the adress of the website, but if you read this, it seems that you found it! ;-) Enjoy your visit!